Packets > ARTWORKS VII TIGER PANEL 36"
ARTWORKS VII TIGER PANEL 36"
The latest digital prints from Artworks bring a world of places and animals to you in striking detail! 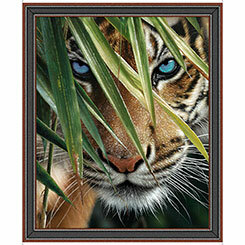 Venture into the wild with our wolf, giraffe and tiger panels or celebrate the beauty of our nation's landscapes. Whichever you choose, these are works of art on fabric! What will you create?